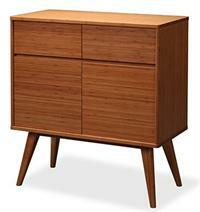 Currant Sideboard Credenza by Greenington Bamboo Furniture. 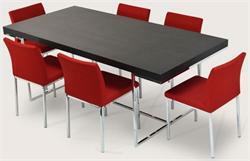 Versatile storage for dining room, living room, conference room, lobby. Doors on each side open out with adjustable shelf inside. Center section has a drawer and flip down shelf. 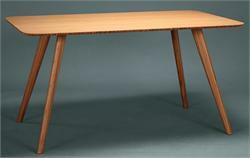 Matches Currant Long Bench, Currant Short Bench, Currant Chairs, Currant Dining Table and Currant Media Center, all by Greenington Bamboo Furniture. These stylish, elegant, and airy lines are inspired by vintage Mid Century Modern Furniture designs. 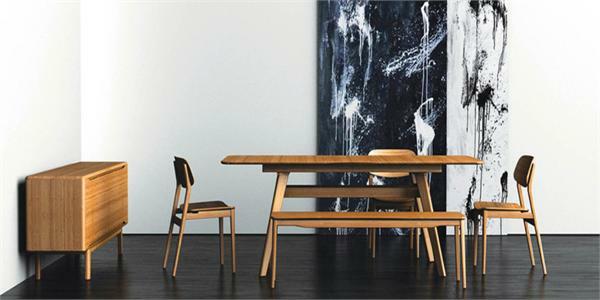 The Currant Dining Collection includes a full dining collection with a 72" leafed Currant Dining Table that extends to 92", Currant dining chairs, Currant bench seating and Currant sideboard, all in our rich honey-toned caramelized finish or dark walnut. 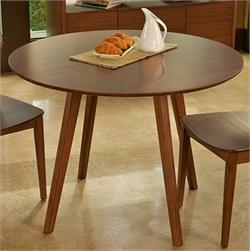 The Currant Dining Collection is one more way to promote sustainability in a lovely, classic and functional way. Greenington Furniture also makes the Hazel Dining Collection + Tulip Dining Collection + bamboo barstools + bar tables all on this site. 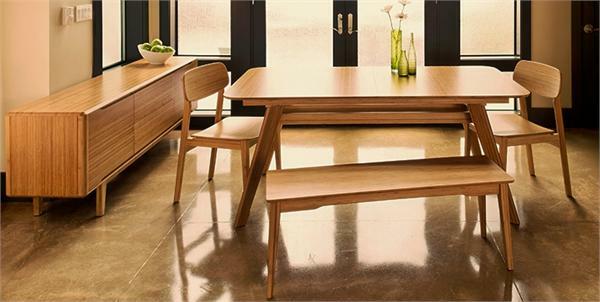 Greenington Furniture manufactures elegant bamboo dining room furniture, living room furniture and bedroom furniture in modern furniture styles. Greenington Furniture uses only mature Moso bamboo that is at least 5 years old ensuring that their bamboo furniture possesses strength, hardness and stability. 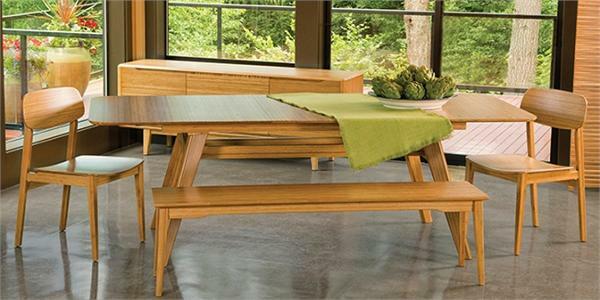 Greenington Furniture utilizes bamboo in furniture production because it is sustainable and eco-friendly. All Greenington Bamboo furniture is made of 100% natural bamboo which is very hard, dense and extremely durable. The Greenington Furniture slogan is “Go with Bamboo, Live with Sustainability,” offering a winning combination of great price points and high quality, durable modern furniture with little to no cost to the environment. Greenington uses mature Moso bamboo, a bamboo species that pandas do not feed on. Greenington Furniture is made of 100% bamboo. Just like wood, Greenington bamboo furniture is a natural product and variations in color and pigmentation are to be expected as normal. 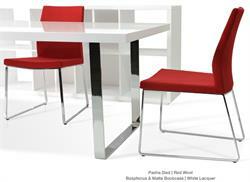 Accurato is an authorized retailer of Greenington bamboo furniture designs. We sell the complete line of Greenington Beds, Greenington Dining Room Furniture, Bar Furniture and Greenington Living Room Furniture. Our clients LOVE our fanatical customer service!